When I was in Bangalore, I had a habit of ordering chicken hariyali whenever we went out for lunch/dinner. I loved this kabab so much that, my brother and husband were tired of eating this dish. I would order this every single time. Chicken biryani and this kabab was my staple every time. My brother finally decided not to go out with me because I would never agree to eat anything else, and since I could never eat it all alone, they had to share these with me. After coming to US, this is one of the dishes that I missed a lot. I tried making it couple of times, but was never satisfied with the results. Finally I can proudly say, I have learned to make the perfect hariyali kabab. I also made a yogurt-mint dip(grind some mint with yogurt and salt) that is usually served in the restaurants in Bangalore. The dip was not exactly same as the restaurant version, but was quite good and went very well with kababs. Few years ago, V’s uncle owned a kabab center in Bangalore. Once we went there to talk to him and he offered us their specialties. While V was chatting with uncle, I was totally immersed in devouring the kababs. Finally I asked him the recipe for this kabab. I don’t remember his exact recipe, but this is what I could recollect. Now that it came out so well, I am going to stick to this. I think my pappa(dad) would have loved this. So I am dedicating this recipe to him. All the ingredient quantities are approximate only. So increase/decrease to get a thick coating on chicken. Make a paste of coriander-mint leaves, ginger, garlic, cloves, cinnamon, pepper, lemon, chillies to a paste. Do not add water. Cut chicken into 2″x2″ pieces. Add the paste, salt, yogurt to the pieces and mix well. Keep it refrigerated for atleast 4hrs (I left it overnight). Line a baking sheet with foil. Arrange the chicken pieces on skewers. Keep the pieces on the sheet. Cover the sheet with another foil(this is very important, otherwise the pieces get dry). Bake in oven at 300F for about 20mins or till chicken is cooked. Take them out. Remove the covering foil. Bake it again for 2mins. Flip the pieces and then bake again for another 2mins (this helps to get the dry thick coating on top). While serving, sprinkle chaat masala on top. Serve hot. PS: If you don’t have oven, shallow fry the pieces on tava. This looks delicious,have to try this . Wow! This looks seriously YUMMY. Shilpa: Smitha, please read the recipe. I have specifically mentioned what to do to avoid drying out. Your pictures looks gr8. Liked the color, hariyali indeed. I am trying this for my chicken lover guests the coming Friday. Thanks. Your recipe comes just in time. So beautiful green with the marination. Could you advise which overn you use, as I am planning to purchase one, but am confused with all the different varities one gets in the market. Shilpa: I don’t know much about ovens. Our oven came with the apartment. It is a oven by Hotpoint. 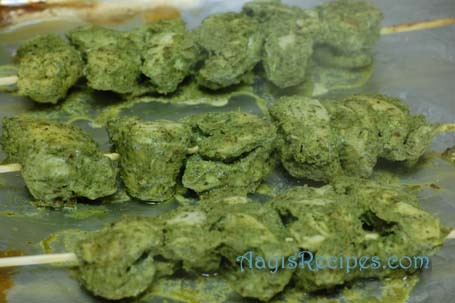 “Chicken Hariyali kabab” – my fav too. Will try ur version of the recipe soon. 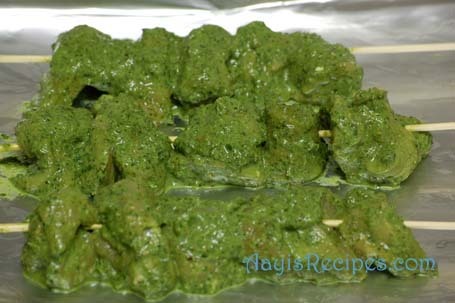 Wowowww, just drooling over those green delicious chicken kebabs..
this looks amazing!! Ur photos r great! always tempting us to try the dish! sure gonna try this and tell u the result!! just the sound of it is making me hungry. delicious recipe. kabab looks yummy,will try this recipe on weekend. This dish looks very tempting….my hubby will love it….i must try…. The paste for this chicken has me drooling. me too love chicken hariyali kebabs:)Those kebabs are mouthwatering. I am a vegetarian and I know I will not be making these.But the pictures are so awesome,I had to leave the comments. Shilpa: 🙂 Try with paneer. I am sure that will be yummy too. This looks absolutely delicious Shilpa. I’ll have to try it some time. Hey Shilpa…. gr8 looking kababs…. i was wondering if we could drizzle some melted butter on it for that extra glaze!! say what!! very nice n easy recipe..will try it one day!!! Will try out this one for sure and let u know of the outcome! If you use the same recipie and remove the yoghurt ,mint, chatmasala from the list and add little turmeric, tamarind,coriander seeds and cumin to it you can get a nice green curry. It tastes better with chicken with bones. I will defintaly try this one out. I love your website! I am looking for a great hariyali chicken recipe because I love it, and the only place I can find it is in a restaurant in Chicago – and I live in Cleveland! I have found several variations, and the kind I get is not in kebab form – which is how I would want to make it. The other recipes I found call for besan, garam masala, cumin, and cilantro. What are your thoughts on using/not using these ingredients, as I see they are not in your recipe? The hariyali chicken I get in Chicago has cilantro in it, according to the menu; so I know I want to include it in my dish, but I have no idea about the other ingredients. Thank you so much!! I look forward to trying your naan recipe! Shilpa: Jessi, I have not see besan being used in hariyali chicken anywhere. But I know for sure that there are many variations to the recipe. So it is your choice if you want to use it or not. You can use garam masala instead of cloves, cinnamon and pepper. I just love home made fresh masalas, so I use these. coriander and cumin seeds are used very frequently in many recipes, I wanted to keep this one simple, so i did not include them. So you can use them if you want. I tried this and it was simply superb!Only drawback was i never got the perfect beautiful green that u achieved!! Neverthless this recipe is for keeps !The kebabs were juicy soft and tasty! This awesome recipe was a superhit in my house! 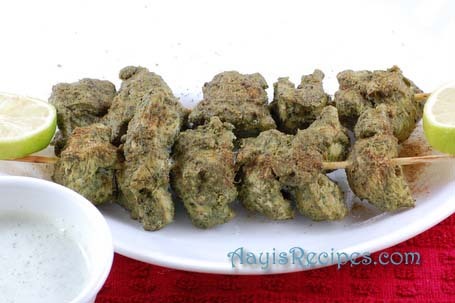 My 2 year old daughter gobbled all of it and my 4 year old loved the “green nuggets on the stick”! This was shockingly easy and turned out great!!! Many Thanks! Do we have to use baking sheet or regular foil.I used the regular foil and the liquid started dripping from the kababs,the taste was good but they were not roasted properly.Do I need to keep the temp more than 300F? Your recipes are really informative…and I feel proud that all our GSB recipes are liked by all..
Shilpa: It is already on this site under side dishes. This looks so tempting! I will try this on our outdoor grill! I have to admit, I have been one of those silent viewers of your blog for the longest time, so why come out and leave a comment now? Well, it’s thanks to this wonderful recipe! I have NEVER EVER cooked chicken, but my husband and daughter were on my case to make it at home so I finally gave in and made this kabab. It was simply delicious and devoured by the family in no time! Thank you! Just by reading your recipe, i can sday you’ve covered the bases and i am sure it’s pretty good. Shilpa, Your website is in my favorites list. Yesterday, I tried your recipe for Hariyale Kabab. It came out very well and was yummy.. Thanks a lot for sharing this with all of us. Even I love haryali chicken kabab. Your recipe is superb n I’m goin to try cooking this on weekend. TIP for the mint dip: grind mint leaves, lil corriander leaves, small piece of ginger, green chillies, one or two peper corn and black salt and then mix it with thick yogurt if you wan you can add few drops of lemon juice to the dip. This dip kind of tastes similar to the dip they serve with the Kababs. All thanks to u 4 the great receipe. Plz send me Mutton Seekh kebab receipe. I am an avid collector of good recipes and ur recipes r simply the best I have come across in a long time! I tried this chicken last week and it turned out to be Superb.I never thought that cooking would be so intersting before visiting your website. I vist your website daily specially for the Konkani dishes.I have tried many of your recipies and all have turned well.My husband awaits dinner time very eagerly each day to check wht special is in store for him. Am waiting to go for vacation to India and treat my folks with the splendid food which I have learned from your site. Thanks a lot again and keep up the good work. Your measurements are off. 1/2 lb is not 0.45 kgs. 1 lb is about 0.45 kgs. Ur recipe was super hit on my birthday party . I usually fry chicken in larger peices, like drumstick, thigh, breast in 2 halves. of a spicy effect while eating the meat. It was as if the marinade had not penetrated. Would I need to marinate for a longer time, or just reduce the size of the peices ? Looking at the pictures, I cannot wait trying this recipe. But i have a microwave oven in which i cannot set any temperature. I have the “micro” and ” grill” option. Can I prepare these kababs in this type of oven? Tried many of your recipes and all turned out superb. I think you should use grill option. i like this kabab recipe ..and try at my home . Just tried this recipe yesterday for an evening with friends. Wonderful flavors and everybody enjoyed it fresh off the grill (yes, we grilled these babies)! Thank u for a great recipe!